Face painting crayons are non-toxic, kid-friendly face paints used to quickly apply theatrical and costume makeup. Similar to lipstick and eyeliner, face painting crayons have a soft consistency and may be applied directly to the face, eliminating the need for separate brushes and sponges. The crayons come in a wide range of colors and several different sizes. You can use face paint crayons alone or in combination with traditional face paints to apply makeup quickly at a party or carnival. Moisten a makeup sponge with water and swirl it in traditional face paint. Apply the face paint all over the face to make a base. Certain costumes – a clown or ghoul, for example – require a white or colored base. It is easier to apply the base with a sponge than to color the entire face with a crayon. If you don’t have traditional face paint, you can break up a piece of a face painting crayon and dip your sponge in it for the same effect. Block in large areas with lipstick or crayon-sized face painting crayons. 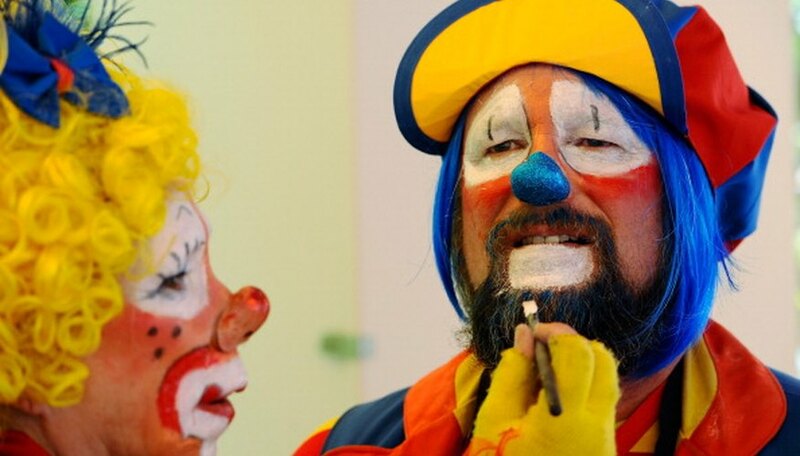 Draw directly on the face with the crayon to make war paint stripes, a clown nose and mouth, black circles around the eyes, hollowed-out cheeks and any large features needed for the desired design. Draw finer details or outline large painted areas with pencil-sized face painting crayons. Use the finer points to draw freckles, eyelashes, whiskers, wrinkles and any small details needed for the desired design. Keep the pencil point sharp with a makeup crayon sharpener made specifically for use with makeup crayons. Wash off face paint with soap and warm water. Only use crayons specifically marked as face painting crayons. Do not attempt to use traditional crayons, colored pencils or pastels to paint faces. Avoid working in excessive heat and sun; face painting crayons may melt in extreme temperatures.